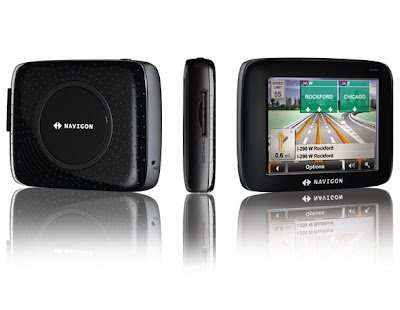 I got up early this morning to get to Staples and purchased the Navigon 2100 GPS. $149.95 This unit is listed $199 everywhere else. I've been looking for a GPS unit for my Dad for some time now. He's reluctant to drive and afraid to get lost at night because he's in his 70's now and his sense of direction and eyesights is not so good now. This way, he can drive my Mom to more places rather than cooped up in the house all the time. I thought it would make a great Christmas gift as it is very difficult to come up with new ideas and useful gifts for him year after year. I tested the Navigon and I really love their 3D Reality view on a 3.5 inch display. It clearly shows which lane you should be if you want to exit to the correct freeway interchange. It's particularly confusing here in LA freeways and really useful feature to avoid missing an exit because you're in the wrong lane. Their text to speech of street names and exits is pretty accurate and it would be great for my Dad so that he doesn't have to constantly look at the display to navigate to where he wants to go. Whenever, I slow down and come to a stop, it displays all gas stations, and restaurants in the vicinity. Some restaurants displays with their logo such as McDonalds and Starbucks coffee. Chevron logo is also displayed for their gas stations. The only drawback is that it's only a 3.5 inch display, and it comes with only a care charger. You'll have to pay another $20 for an adapter to charge it indoor with a household electrical outlet.